Dear readers! In line with our goal to expand our scope of support, we are pleased to inform you that we have created a new set of tutorials, frequently asked questions (FAQs), how tos and tips for another device. And this time, it’s on the latest HTC flagship smartphone — the HTC One M9. This will be the first part of the series, which we schemed to help users get familiar with the interface and make the most of the features embedded in this new gorgeous Android smartphone by HTC. Similar to its predecessor, the HTC One M9 smartphone comes with a stunning metal design with a bright, sharp display and strong speakers. It is running the latest Android OS version with the new Sense 7 software that is deemed simple, responsive and highly customizable. Most importantly, the M9 is packed with decent speed and software enhancements and still features an expandable storage. The SIM card is an IC card that contains your phone number and other relevant information. Depending on the terms and conditions, your carrier may held you responsible for any damage caused by inserting the SIM Card in another-brand IC card reader. So to evade from any possible consequences, proper handling of the SIM Card is a must. Ensure the IC chip is clean at all times. When cleaning, use a dry, soft cloth and wipe it gently. Do not apply labels as they may damage the SIM card. To ensure proper handling, see instructions included with the SIM Card. Before inserting or removing the SIM Card, make sure your phone is completely powered off to prevent damage. In case of loss or damage, inform your carrier immediately. To prevent loss of or damaged information, be sure to keep a separate or backup copy of information stored on the SIM card. If your SIM Card or phone is stolen or lost, be sure to follow the emergency procedures to suspend service or contact your carrier to inform them of what happened. When the phone is powered off, hold the phone face down. Get the tray eject pin provided in the box. Locate the small hole next to the nano SIM card tray slot, and fully insert the tray eject pin into it until the tray ejects. Gently pull the tray out. Place the nano SIM card into the tray. Be sure to position the nano SIM card’s gold contacts facing up. Now, insert the tray back into the slot. One advantage of the M9 over other high-end phone rivals is its SD card support, giving users an option to expand the phone’s storage capacity by using an optional SD card. In fact, it can support cards up to 128GB (gigabytes). Be sure to keep a separate copy of all your important files or information stored on the SD card, to prevent possible data loss. To avoid issues while reading or writing data to the SD card, never power off the phone in the process. Also keep your phone charged or ensure it has sufficient power because you may not be able to read or write data to the SD card with a low battery. Hold the phone facing up. Get the tray eject pin and then fully insert it into the small hole located next to the microSD card tray slot until the tray ejects. Gently pull the microSD card tray out. Place the microSD card into the tray. When the microSD card is secured in place, insert the card tray back into the slot. Locate the small hole next to the microSD card tray slot and then fully insert the tray eject pin into it until the tray ejects. Now pull the microSD card out of the slot, carefully. It is always recommended to unmount the SD card before removing it from the phone. Doing so will prevent any serious error from occurring between the microSD card and the device itself. It will also prevent the microSD card from becoming corrupted or damaged. Tap the Home icon to begin with. Tap the All Apps icon to continue. Tap the Settings App icon to get to the Settings menu. Tap Unmount SD card under SD card option. Hint: When the SD card is already unmounted, you will see the menu option label changes from Unmount SD Card to Mount SD Card. When the card is already unmounted, you can remove the microSD card from the slot safely. When you format the SD card, all the data from the card will be deleted or erased, and the files cannot be retrieved. That being said, please check the card’s contents and back up all necessary files beforehand. Next, tap the All Apps icon. Tap the Settings app icon to open the settings menu. Tap Unmount SD card under SD card. Tap Erase SD Card to confirm action. Hint: If you have set up a screen lock, you may be prompted to enter the lock screen before you can proceed. All data on the SD card will now be erased, and the card is already formatted for use on your device. Just like most flagship smartphones these days, the HTC One M9 does not come with a removable battery. And like the Galaxy S6, the One M9 sports fast charging feature, which according to HTC will give you 60% of your battery in just 30 minutes of charging using a special cable. But contrary to HTC’s claim of a “slightly higher-capacity battery” than its predecessor, it turns out that the One M9 does not brought a huge jump in battery life than the One M8, especially with intensive use. To help you get more out of your M9’s fixed (built-in) battery and fix any battery drain issues you might be experiencing, we’ve got here a few charging tips you can refer to. Hint: You can charge your M9’s battery using either the AC adapter or using a USB cable on your computer. Use only the USB cable and adapter that came with your phone to charge the battery. But it is highly recommended to use the power adapter to charge, especially when the battery power is too low. There are times that the battery may stop charging to avoid overheating. There’s no need to worry though because this is just a safety precaution. Your phone may become warmer especially when you are using the Internet while charging the battery. This too is normal. It is also recommended to unplug the power adapter from the electrical outlet after you finish charging to conserve energy. Plug one end of the USB cable into the AC adapter. Plug the other end of the USB cable into the charger or accessory jack located on the bottom panel of the phone. Plug the AC adapter into an electrical outlet. Hint: When charging starts, you will see the indicator light illuminates. It may take up to three hours for the battery to fully charge. When the battery is fully charged, the light turns green. Disconnect the phone from the charger once you’re done charging. Unplug the AC adapter from the outlet. Remove the USB cable from the phone. Locate the small end of the USB cable and insert it into the charger or accessory jack at the bottom of your phone. Locate the large end of the USB cable and insert it into an external USB port on your computer. Hint: It may take longer for the phone’s battery to become fully charge using this method, so just wait. When the battery is fully charged, disconnect the USB cable from both the phone and the computer. Similar to other high-end devices with fixed or built-in battery, how long the M9’s battery can last before it needs recharging varies on how you use the phone. In order to extend battery life, power management is important. Tap an app to check how it is using the phone’s battery. You will then see how much power is used by resources like the CPU for an app and other usage information. Hint: To adjust settings that affect battery usage, or stop an app, just tap the appropriate buttons while viewing an app’s battery use details. One way to extend battery life is by turning off wireless connections like Bluetooth, mobile data or Wi-Fi when not in use. Turn off GPS. It also helps when you turn GPS on only when you need to get a precise location or when using navigation or location-based applications. If not necessary, you can turn location services like GPS on your M9 device. To turn location services on and off, tap the On/Off Turn it off when not necessary. In case you want to find your location, enable the feature and then select the location mode you prefer under Location sources. Like for instance, if you want a better estimate of your location, select High accuracy. To save battery power, select Battery saving. Note: Remember that if you turn off a location source like GPS, there will be no apps on the HTC One M9 will collect your location data through that location source. But there are third-party apps that may location data for your M9 device using other sources like Wi-Fi. Enable Sleep Mode option on your phone. Enabling this option at low peak times will turn off the data connection after your phone screen has been off for 15 minutes. During these times, there will be no network activity, no downloads, streaming or data usage. When you switch the screen back on, that’s when the data connection resumes. Enable Airplane mode when you don’t need Wi-Fi connections and you don’t want to receive calls or messages. Manually lower the screen brightness or use automatic brightness or the default screen brightness. Shorten the screen timeout or use shorter time for the screen to sleep. As for the Home screen, use plain or black wallpaper instead of live wallpapers or animation effects. Though these are nice to show off to people, they drain your battery quick. The less color is displayed the lesser the battery power is consumed. Disabling or uninstalling applications that are no longer in use, especially third-party apps can also help extend your phone’s battery life. It is also recommended to stop or close apps running in the background even when they’re not in use. For applications that come pre-loaded and can’t be uninstalled, you can temporarily disable them to prevent them from continuously running or syncing data. Finally, installing the latest software and app updates may also help as updates generally include performance enhancements including that of the battery. Sync and background data are among the common factors that would trigger quick battery power drain on a device like the M9. It happens when you allow apps to sync data more often. One thing you can do to stop this is to determine which apps can be configured with longer sync time, or can be synced manually. To check and see the types of data that are being synced in your online accounts, go to your phone Settings, and then tap Accounts & Sync. You can temporarily disable syncing some data, especially when the battery gets low. Adjust the settings under Sync schedule. You can also limit syncing weather updates on your device, especially if you’re not traveling from different places. You don’t really have to sync weather updates of all your named cities. To configure these settings, open the Weather app, and then tap the Menu icon to edit and remove unnecessary cities. Carefully choose which gadgets to use as some widgets constantly sync data. So, use only what’s needed and eliminate those that are not important from your Home screen. Tap the Menu icon (three-vertical lines). Clear Add icon to Home screen. To manually update apps from the Play Store, tap Auto-update apps, and the select Do not auto-update apps. Lower down ringtone and media volume. Minimize the use of sound feedback or vibration. To do so, go to Settings, tap Sound & Notification, select which ones are not needed and disable them. You can also check your apps settings to view more options that would optimize the phone’s battery. If you are new to Android phones and got the M9 as your first, here’s a quick guide for you to turn on the phone On/Off and restart it. Turning ON: To turn on the M9, press and hold the Power/Lock button located at the right panel of the phone. When the phone is turned on, you will hear or feel it vibrates. Hint: A setup app screen usually prompts (depending on your carrier), the first time you turn on your device. Turning OFF: To turn your M9 off, press and hold the Power/Lock button to display the Power options menu. Hint: Pressing the Power/Lock button when the screen is locked will only turn off the screen, not the phone. To turn the phone off, you need to unlock the screen first using the screen lock method you used. Press and hold the Power/Lock button for about 2-3 seconds or until the Power options menu displays. Tap to select Restart on the Power options menu. Tap Restart again in the Restart phone confirmation prompt, to confirm action. Restarting is especially recommended when the phone or touchscreen becomes unresponsive or freezing. To do so, press and hold the Power/Lock button for about 10 seconds. Tap or Touch – used to type using the onscreen keyboard, select onscreen items like apps and settings icons, or press onscreen buttons. Use your finger to tap or touch items. Touch and Hold – used to open or launch available options for an item like opening a link in a webpage. To do so, touch and hold the item with your finger. Swipe or Slide – used to go to other widget panels, scroll documents, and the like. To swipe or slide, quickly swipe your finger horizontally or vertically across the screen. Drag – used to drag an item, like when you move an item to another location. To drag, simply touch and hold your finger with some pressure before you begin to drag. Do not release your finger while dragging, until you’ve reached the target location. Flick – it’s similar to swiping except that you have to swipe your finger in light, quick strokes. Flicking the screen is always done in a vertical direction, like when flicking the message list or contacts. Touch and Flick – used to move a widget or icon from one screen (Home screen) to another. To do so, touch and hold the item with one finger, and then flick the screen to the new location using another finger. Pinch and Spread – used to zoom out or zoom in pictures or webpages. To pinch the screen, use your thumb and forefinger. To zoom out, move your fingers inward, and outward to zoom in. To zoom out of the picture or text, just slide your two fingers together. Two-finger Swipe – using two fingers to swipe down from the status bar and access Quick Settings. Three-finger Gesture – using three fingers to swipe up and share contents like photos, videos and music from your phone. You can also use this finger gesture to share streaming media from apps like YouTube. To disconnect from the device, swipe down your three fingers. Hint: By default, media gesture is enabled or turned on in Settings, allowing three-finger gesture to work only when sharing content or using HTC applications. Also, the three-finger gesture may not be available when TalkBack gestures are turned on. Three-finger Tap – used when using the HTC Car app. To activate the voice command mode, tap the screen with three fingers. Basic operations with the HTC One M9 like rotating the screen, muting the phone, lowering the ringtone volume, and the like are done using the following motion gestures. Tap the Home icon to get to the Home screen. Tap the Apps or All Apps icon. Mute once – to mute only once after you flipped your phone. When there are subsequent incoming calls, the phone will ring again. Mute always – to keep the phone muted for all incoming calls, after flipping the phone to mute a call. Select or clear Quiet ring on pickup. Pocket mode is another M9 feature which you can set to hear your phone ringing even in noisy places. Select or clear Pocket Mode. Just like other high-end smartphones, you can automatically change the M9’s screen orientation from portrait to landscape by turning the phone sideways. This is applicable for most screens. For example, you can turn the phone sideways to bring up a bigger keyboard when entering text. Clear the Auto-rotate screen option. Hint: Turning off auto-rotate makes TalkBack accessibility feature works best. If you haven’t yet activated your device, we offer you some guidelines on how to activate the HTC One M9. Some M9 variants are already activated and ready for use upon purchase. But it may vary depending on your account, or how and where you bought it. In some cases, you may need to activate it on your carrier account. The first time you turn the phone on, you will be prompted with a Hands Free Activation screen, which may be followed by a PRL Update screen and a Firmware Update screen. Just follow the onscreen instructions to proceed. You can activate it on your computer online or directly on your phone. To activate on your computer, you may need to visit your carrier’s activation page and complete the online instructions to complete the activation. To activate directly on your phone, turn your new phone ON, and it will automatically attempt Hands-Free Activation. To override auto-activation and start manual activation wizard, tap Activate. To complete the activation process, just follow the onscreen instructions. You may need to make a phone call to confirm activation. If your phone is still not activated, please contact your carrier for further assistance. While the phone is being activated, do not press the Power/Lock button because doing so will cancel or terminate the activation process. The first time you switch on your HTC One M9, you will be prompted with setup screens for you to set it up. In the on-device setup, you can choose your Internet connection, sign in to your accounts, set up your screen lock, and more. 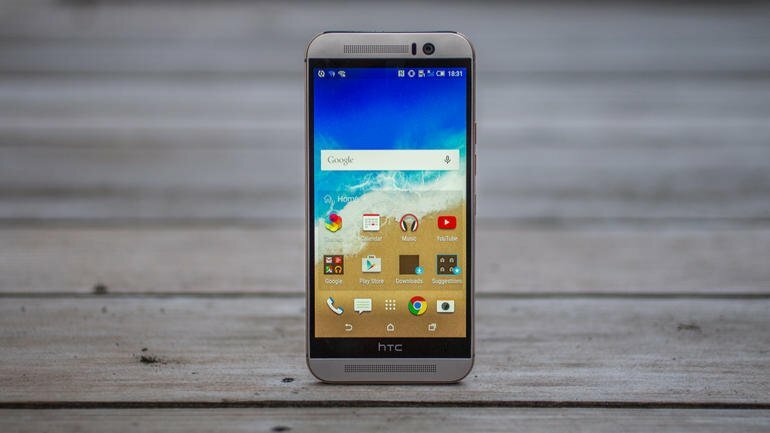 You will also be provided with different methods to transfer or restore contents to your HTC One M9 during the setup. Google Backup – select this method if you’ve used it to back up your old phone before and you only need to restore apps and no other types of content. To do so, select your old phone and the apps you want to restore to the HTC One M9 on the Get your apps & data screen. If you have other types of contents or files to transfer or restore from your old phone, tap Restore from this backup and then choose Set up as new device. HTC Backup – select this option to resture a previous backup from your cloud storage. To do so, sign in with the account credentials you used as your HTC account on the HTC Advantage screen. Alternatively, you can tap Restore from HTC Backup on the Transfer or restore content screen. To transfer contents from another phone (Android, iPhone, or others) tap Transfer content on the Transfer or restore content screen. Transferring of contents, contacts, messages, calendar events, music, photos, videos, and other files from other phones or your computer to your new HTC One M9 is made easier using the HTC Transfer Tool, Bluetooth, or direct USB connection. Follow these steps to transfer contents to your new phone. Hint: To use the HTC Transfer Tool on your old phone, it needs to run Android version 2.2 or later. For devices running earlier Android versions like 2.1, file transfer can be done using Bluetooth. If you are setting up your M9 for the first time, choose Transfer content on the Transfer or restore content screen. Alternatively, you can go to the Home screen, tap All Apps icon, tap Settings, and then select Get content from another phone. Select whether you want to transfer from an old HTC phone or other Android phone. Tap Full transfer, and then tap Next to continue. Follow the onscreen instructions on your M9 to download and install the HTC Transfer Tool from the Play Store to your old phone. Install the tool and open it. When prompted with the PIN on your old phone, make sure it matches the PIN appearing on your new phone before you proceed. Hint: If the PIN is not displayed, it could mean that your old phone is unable to connect to your new phone. If this is the case, tap Try another transfer method on your M9 to use Bluetooth to transfer files from your old phone instead. Select the types of content you want to transfer on your old phone, and then tap Start or Transfer. When file transfer is finished, tap DONE on both phones. Transferring of files from an iPhone to the new HTC One M9 can be done in three ways including through iCloud, iTunes, and Bluetooth. Tap All Apps icon from the Home screen. Select Get content from another phone. Select Import from iCloud backup. Key in your iCloud email address and password. Follow the onscreen instructions to back up your iPhone content to your iCloud storage, and then tap Sign In. Select the iPhone backup you want to transfer to the M9, and then tap Next to proceed. Select the files you want to transfer, and then tap Import. Wait until the file transfer is completed, and then tap Done. File transfer via iTunes – to transfer files using iTunes, back up your iPhone contents using iTunes on your computer and then use the HTC Sync Manager to transfer files to the HTC One M9. Hint: if you are setting up your M9 for the first time, choose Transfer content on the Transfer or restore content screen, instead. Enable Bluetooth on your iPhone and set it to visible mode, when necessary. To pair both devices, follow the onscreen instructions and start transferring of files afterwards. Connecting your phone to your computer – when you connect your M9 to your computer, the latter device will recognize it as a removable USB drive. Once recognized, you can start copying media files between them. Downloading and using the HTC Sync Manager software on your computer – this method lets you set up your pone to automatically get photos, videos, and music off your phone to your computer. Syncing with your computer – for this method, you will use the HTC Sync Manager to transfer contents from between your phone and a computer (Windows or Mac OS). Using Google account – when you sign in to your Google account, your Google contacts are imported to your phone. Using Social network accounts – To sync contact information from your social network accounts, you need to log in to that account. Using Microsoft Exchange ActiveSync – Your work contacts are synced from the Microsoft Exchange ActiveSync server in your workplace. Using Phone contacts – use this method to create contacts locally on your phone, in case you don’t prefer to store them on your online accounts. Select Restore from HTC Backup on the Transfer or restore content screen, and sign in to your HTC account or Google account. Connect your phone to the Internet using your mobile data or Wi-Fi connection. Tap Sign in with Google if you used your Google login information as your HTC account and your backup is in Google Drive. Otherwise, tap Remind me later, go to the Transfer or restore content screen, and the choose Restore from HTC Backup. Follow the onscreen instructions to restore your backup and proceed with phone setup. To check if there’s any notification to complete the phone setup, slide open the Notifications panel. Free apps that you have previously downloaded from Google Play will then be restored in the background. By then you can track the progress through a notification in the status bar. You can also restore paid apps by downloading and installing them from the Play Store. As the apps are installed, they will appear on the Apps screen. In addition, the Home screen and Apps shortcuts will also be re-organized as in your backup after your applications have been completely installed. While the apps are being restored, you may continue using your new phone. Important Note: Backup restoration on your new phone through data connection may take a lot of time and data depending on the amount of content. In this case, using Wi-Fi connection is recommended. And that concludes the first part of our series on HTC One M9 Tutorials, FAQs, How Tos and Tips. Please keep posted for more relevant contents to be published soon in this site. For more questions, specific tutorial requests, and HTC One M9 issues to address, feel free to drop us an email at [email protected]. We will be glad to assist you further. You may also visit our Facebook page to keep track of our latest posts and website updates through Facebook Newsfeeds.